Church of Jesus Christ of Latter-Day Saints leaders are part of a conspiracy. The Church of Jesus Christ of Latter-Day Saints leaders plan a conspiracy to dominate America,the US government and the world with Mormonism. Church of Jesus Christ of Latter-Day Saints leaders have furtive intentions to dominate the world with Mormonism. At the website Mormon Conspiracy To Rule America you'll find a very comprehensive volume dealing with Church of Jesus Christ of Latter-Day Saints issues that most others who have written about the LDS have left untouched, namely the political ambitions of Church of Jesus Christ of Latter-Day Saints and how they have become successful toward this goal, unnoticed by the majority of Americans. He has captured the "spirit of Mormonism" and understood the internal structure of Mormons amazingly well without ever having been a Mormon. Dr. Wood's research and conclusions show originality and give helpful conclusions which open the reader's mind to see the true nature and plan of the Church of Jesus Christ of Latter-Day Saints for America and the world. 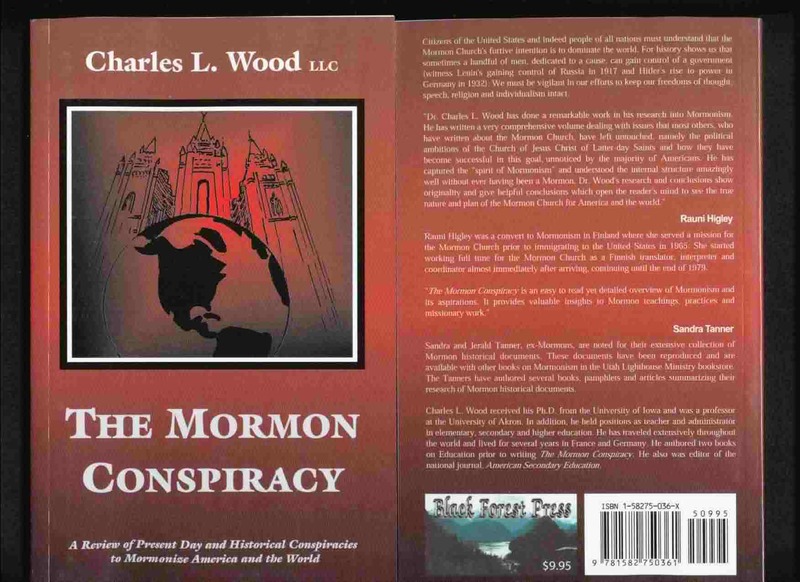 The book The Mormon Conspiracy reveals to the reader the political ambitions of the LDS and how they conspire to control America with its growing membership of Mormons. From the days of Joseph Smith to the present time, the LDS has developed an extensive social and peer group organizational conspiracy to keep members. The active member spends many hours a week in related activities that include attendance, volunteering, and social activities. Everyone in the family is immersed in LDS sponsored activities, which include volunteer service as home teachers (men), visiting teachers (women), as members of a basketball league, attending Boy Scout meetings, acting as Boy Scout leaders and for adults serving on the various auxiliaries. Other jobs in the LDS include bishops and their councilors, stake presidents and their councilors, Elders’ Quorum presidents and their councilors, teachers in Relief Society, Mutual Youth Organization, Primary (for Children under 12) etc. All of these LDS programs are directed by local volunteers, who receive their direction from Salt Lake City. Since time commitment to Church of Jesus Christ of Latter-Day Saints activities is very heavy, little time is left for activities other than one’s job. The sacraments, testimony, and preparation for class instruction take up a good portion of Sunday which is supposed to be a day of rest and free from any kind of work. The freedom from work is substituted for work performed in LDS buildings, buildings that would be recognized by those familiar with Mormonism. They are without flair, of plain construction, low and long buildings with white steeples rising several feet over the rest of the building. Inside is found a small gymnasium, used as a gathering room for dinners and receptions, with a kitchen close by. They usually also have a stage for presentations and entertainment. Most of the stakes built in the second half of the twentieth century have the same design, with the only variation found in outside coverings, some with brick and some with wood. Often stakes serve two different wards on Sundays due to the large membership in the area. Learn more at the following website links.